"At Google, our goal is to create the most comprehensive, relevant and fast search in the world. In the past few years, an entirely new type of data has emerged — real-time updates like those on Twitter have appeared not only as a way for people to communicate their thoughts and feelings, but also as an interesting source of data about what is happening right now in regard to a particular topic." "Given this new type of information and its value to search, we are very excited to announce that we have reached an agreement with Twitter to include their updates in our search results. We believe that our search results and user experience will greatly benefit from the inclusion of this up-to-the-minute data, and we look forward to having a product that showcases how tweets can make search better in the coming months. That way, the next time you search for something that can be aided by a real-time observation, say, snow conditions at your favorite ski resort, you'll find tweets from other users who are there and sharing the latest and greatest information." 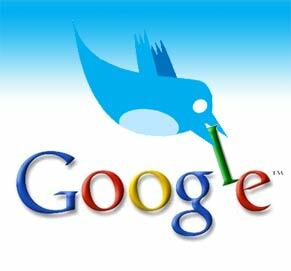 Last April, TechCrunch in a certain way anticipated this move, under the post Sources: Google In Talks To Acquire Twitter (Updated) , reporting rumors sourced from two separate people close to the negotiations: "Google is in late stage negotiations to acquire Twitter." "We’ve been arguing for some time that Twitter’s real value is in search. It holds the keys to the best real time database and search engine on the Internet, and Google doesn’t even have a horse in the game." "More and more people are starting to use Twitter to talk about brands in real time as they interact with them. And those brands want to know all about it, whether to respond individually or simply gather the information to see what they’re doing right and what they’re doing wrong. And all of it is discoverable at search.twitter.com, the search engine that Twitter acquired last summer. People searching for news. Brands searching for feedback. That’s valuable stuff." According to Michael, "the deal Google wants: a real time feed of Twitter updates to speed indexing." "Without that feed Google must independently index each Twitter user periodically to look for updates. That means it’s dreadfully slow in grabbing all those Twitter posts. And it’s also very expensive from a computing resource standpoint. A real time feed would be of huge value to Google, and they’d be smart to nail down a long term deal sooner rather than later." "A real time feed of Twitter posts would negate much of the head start Twitter has in the nascent real time search space. It would be a coup for Google to get the Twitter milk without having to buy the cow. The real question is, does Twitter fully understand the value of this feed?"